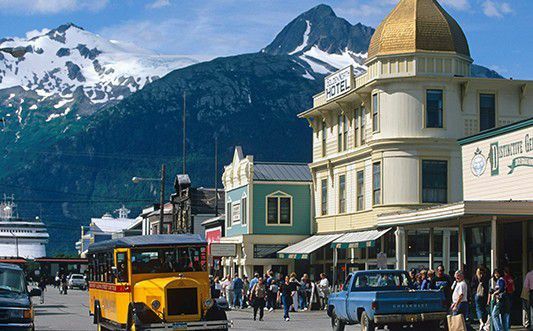 The Westmark Skagway is adjacent to the town’s historic district and within walking distance to the cruise ship piers. 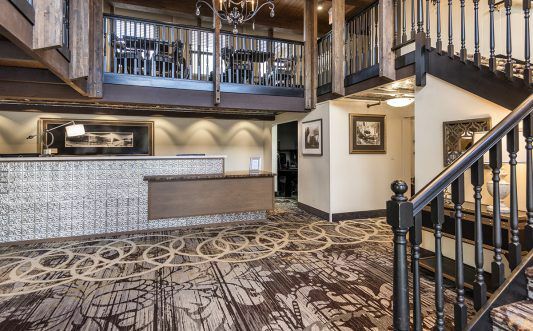 With 114 guest rooms, 2 meeting rooms and 2 restaurants available on a private rental basis, the Westmark Skagway is ideal for your next business meeting or social function. Our professional staff will assist you in the planning process of your event and ensure that execution of the event is flawless. The Inn is open seasonally, mid-May through mid-September. 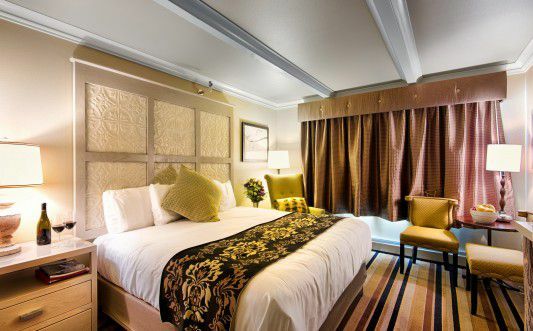 The Westmark Skagway offers Gold Rush charm with modern amenities. 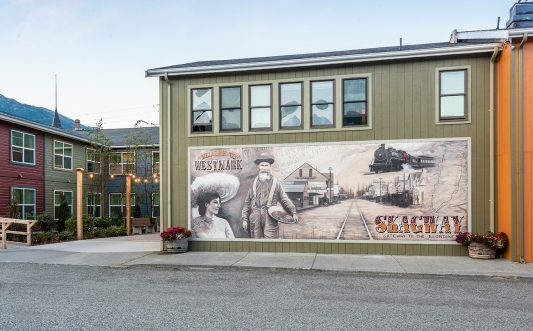 A mural depicting local history decorates the side of the Westmark Skagway. 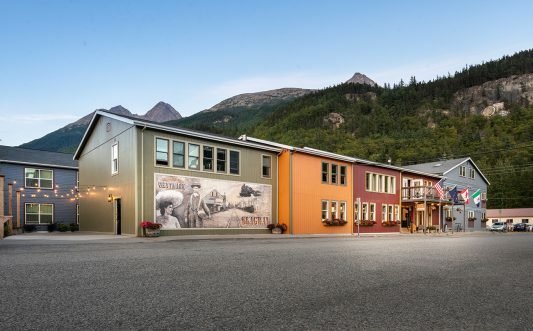 The rich and colorful history of the town is reflected in the exterior of the Westmark Skagway. 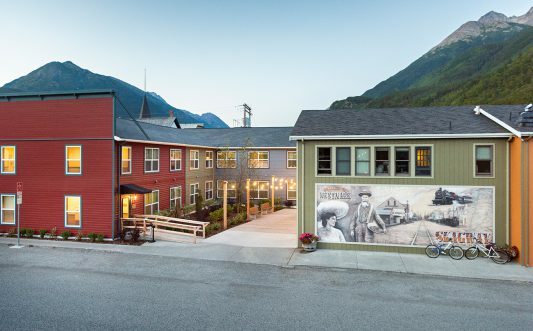 The Westmark Inn Skagway is adjacent to the town’s historic district and within walking distance of the cruise ship piers and the Klondike Gold Rush National Historical Park. 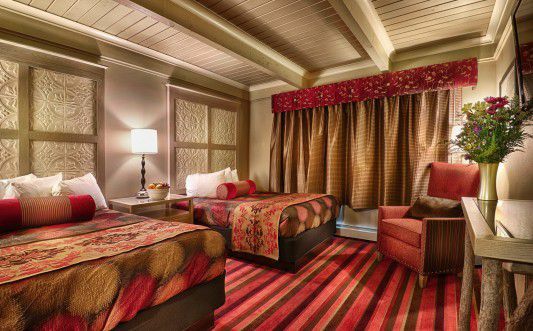 Settle into one of our several comfortable couches and relax as our Gold Rush décor takes you back to the days of 1898. 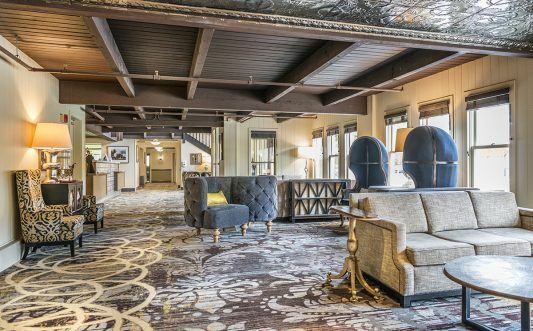 Explore the hotel and learn more about the days of 98 as you venture up the winding staircase to the second floor. 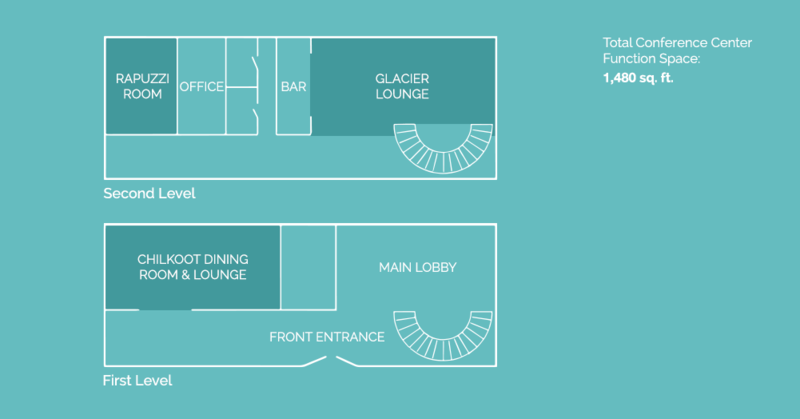 Dine in style in the Chilkoot Dining Room or enjoy an authentic Alaska bar scene at the Bonanza Bar & Grill, located just off Broadway Street. 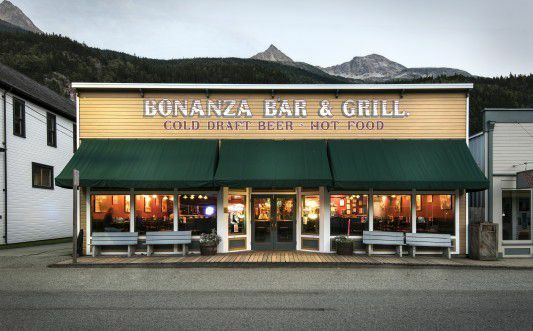 Step in to the Bonanza Bar & Grill for a burger and a pint of your favorite Alaska microbrew. 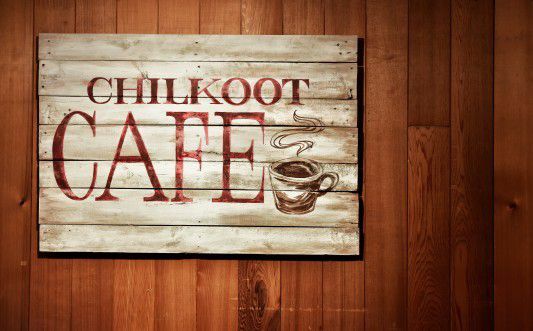 Stop in for your favorite espresso beverage or pick up a light breakfast at the Chilkoot Cafe. 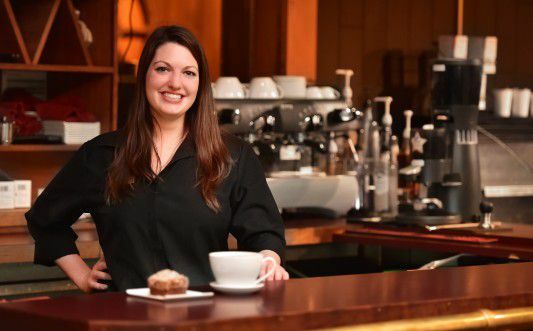 Our friendly staff is more than happy to make your favorite espresso beverage or simply pour you a hot cup of joe. 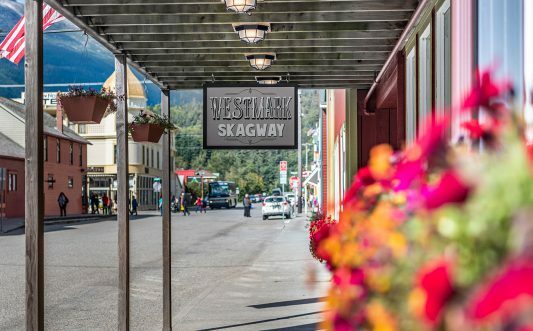 Conveniently located off of Broadway Street, the main drag of Skagway, the Westmark Inn Skagway is within walking distance of every shop and eatery in town. 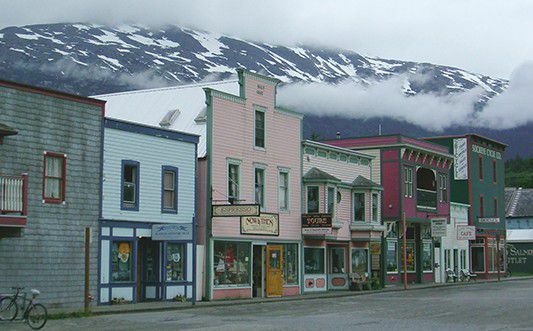 Skagway was the gateway to the Klondike Gold Rush and today still celebrates its history by maintaining its buildings and boardwalks to replicate the Gold Rush days. 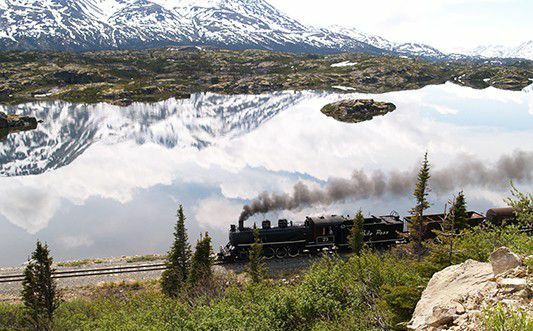 Built in the late 1800's, the White Pass & Yukon Route is a narrow gauge railroad and an International Historic Civil Engineering Landmark. 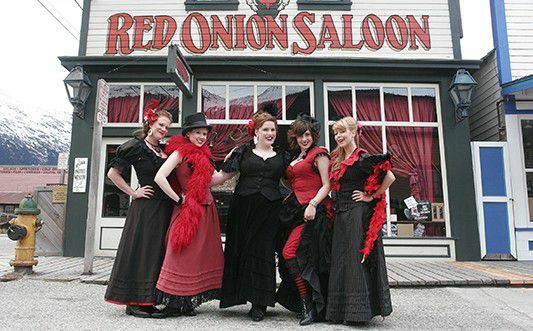 The Red Onion Saloon was Skagway's most exclusive bordello during the Klondike Gold Rush. 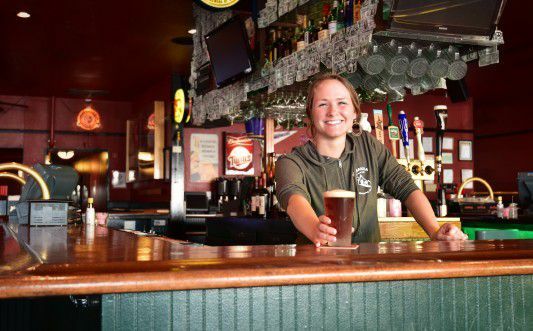 Today, it operates as a bar and is only a couple of blocks from the Westmark Inn Skagway.